Lately, Viki is acquiring lots of Chinese dramas and I'm very happy, BUT that means a very hard if not an IMPOSSIBLE work for Translators, Moderators and MOST OF ALL, Editors. I wonder if viki cares of "other language translations" (which are the distinctive part of this community) as many dramas are completed, but the release for other languages, in too many dramas, got freezed. May the staff will lend a helpful hand to those generous and very busy vikiers? Someone told me this post is an insult to English Editors. If they felt hurt, I do apologize, but it was made out of love. It's not an insult, it's a reality. There are many dramas, few contributors. No matter what level we are stuck with, by the segmentation that takes longer, the English translation and English edition that takes longer, or even the translations in the different languages and their edition, the reality is that the community is limited. Taking care of so many dramas at once is difficult and tiring for everyone. The English translation still seems to be here, but the reality of other languages... actually takes more time. This is understandable both for English editions and for the lack of translators in other languages. Editors are limited in English but not only in English, in all languages. Although Viki seems to help English translation teams sometimes, I do not see how viki could help teams from other languages. You mean in english edition? In all language translation? But, in fact, the reality is that we are everywhere, and nowhere at once. mostly work by myself (sometimes others come to help ). if they are going to do this more often or not. I don't think your comment was an insult, it was the honest truth. I always try to look out for the Other Language teams and feel guilty when our great subbers have sped through a project and unforeseen circumstances prevent the Editing Team from progressing just as fast.That's why I always stick with a project through thick and thin to completion. At least you'll know I'm sitting right there with you. @theparrot I love parrots I have two one been with me since 1994, the other one since 2013. Now to get back to the subject, here is my opinion Viki headquarter is here where I live in SF, CA there is a very large Asian community here with Chinese, Koreans and Japanese who understand English and there own native language. I do know the Chinese language Mandarin but my time will not allow me to be a translator. I don't know why Viki will not just pay people to be a translator they are surrounded with Asian people here in the city where their headquarter is located I am sure there are some people older and younger who can translate. And NO your post is not an insult. Here is a Chinese-English subber offering to help. I think all of a sudden there's a shortage of people willing to be Chinese-English Translation Editors, so there's a long wait if the regular TE has to become unavailable long-term for any reason. Maybe if we can come up with some good suggestions for the Chief Editors/CMs, we can solve the situation for the Other Language Mods. Teaching/training TE takes some time, but it's a sort of investment. I don't know how it works in Chi-Eng sector. In Italy there's Viki Academy (187 members with different level of skill) and some of them were trained to be TE during the usually very long Chinese Historical Dramas. Yes, the Chief Editor must be willing to spend some time to teach them and to share with them his/her experience, but benefits are paramount. The translation in this way isn't very fast (4 episodes a week) as the new Editors are learning, but it never stops till the end. Quite reassuring for the public. That's fascinating! A Viki Academy would be great. Tell us more how you got it started for the Editors. Does it link up with the other Viki seg/sub schools? Believe me sometimes releasing 4 episodes a week on some dramas would be a godsend. There's a test to enter the Academy, just to know from which level you may start. Some time ago there was a sort of idea to link the Italian Academy to Viki sub school, but nothing happened. The majority of the members are devoted to Kdramas BUT I found some subbers interested in translating Historical Cdramas to form a good team. Italian public usually don't get Historical Cdrama translated from start to finish because they are too long to be the task of JUST one person. You need a team and the start was very hard: Song of Phoenix, 78 episodes. It was relay team, members could come and go, just to get used to the lenght of the drama and not to be scared of it. After the edit, the episode is left open to see the Editor's work. There are some "rules" to follow, some words not to be used (they ruin the style), ecc. Each language has got its peculiarities. About new Editors it's the same, they edit and the Chief Editor check their work (and the subbers too). That's really improve subbers' work and make Editors' lives easier On Ruyi there are four TE Editors, they edit an episode a week because, as usual, they are very busy with many projects at the same time, AS ALL OF US. When a drama has got such a length, really needs lots of hands working on it, hands which have not to be tired to give their best. Hi. I understand what are you saying. But, they are limited translators because many managers do not let you in. What I am saying is that I SENDED A LOT OF INBOX TRYING TO BE ON A TEAM. I WANT TO CONTRIBUTE TO THE COMUNITY. But moderators have their own team, and it's very hard to get in. It's a closed circle. I literally sended like 100 inbox, and nobody answered me. I want to help, but nobody gives you the chance. Hello! Do you guys know of any frozen/unfinished Chinese dramas/movies (any genre) that I could offer help with Chinese-Eng subtitling? I hope to find one where channel moderator might possibly give me a chance, even if I'm not an expert. I have experience subtitling, and I'm hoping to be fluent in Chinese by the end of 2018. I'd really like to assist wherever I can. So yes, if any of you know of any projects that need help, or if you're moderating/managing any, please don't hesitate to let me know!! @macucax this is often the case with on air dramas. Plus if you are new and don't have QC status (Qualified Contributor) that can also affect the access to some dramas as well. Have you tried the Project finder, you should see dramas that are either unfinished or unlocked and always contact the CM or your respective Language Moderator, if you get no response try to write in community page in the Help Center. 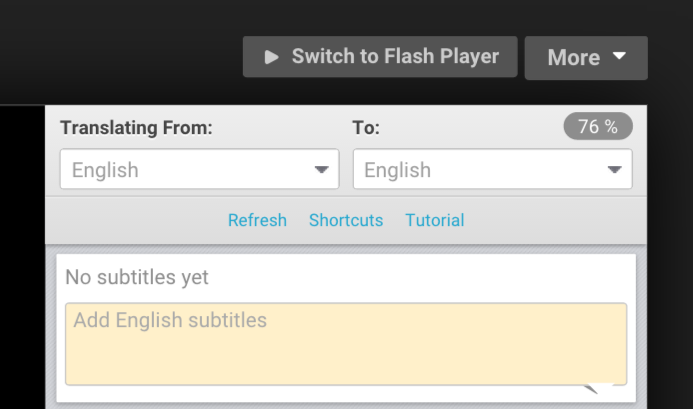 Read the common rules and guidelines for subtitling. @szpitts_694 go on your main viki page to Community and click on Resources and look for Project Finder. If you put in the selections you'll see some Designated dramas which are locked in and some open ones, likely old projects.